Call it a stick, or don’t call a stick. – Speak! Speak! 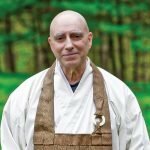 Hogen Sensei explores the interplay between the relative and absolute, suffering inherent in our attachment to the limited conceptions of our self and reality, and learning to trust the immediate completeness of our moment-to-moment experience.